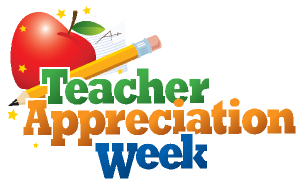 National Teacher Appreciation week starts Monday! Tomorrow begins a week of appreciation for all teachers that help guide our children all year long. Let's show them how special they are!! All parents are encouraged to show their support in some small way, either by a handmade card or sign, flowers, snacks, treats, goodies, beverages. On your next trip to the grocery store, maybe pick up something a little extra for the teachers. Goodies can be brought in to the office each day. They will be placed in the staff room for all to enjoy. This is a very special opportunity to show our teachers how much we care! Thank-you on behalf of the PTO! We are very pleased to welcome our new long-term substitute French teacher, Monsieur Baptiste Delvalle. Monsieur Delvalle is a native speaker of French and is bringing a language immersion approach to instruction in French. He has worked with our after school program teaching French through cooking. Our students are already benefitting from Baptiste’s engaging efforts. Our student performers recently completed their very successful drama production of Willy Wonka and the Chocolate Factory. This production, made possible by our partnership with the Very Merry Theatre Company, provided an opportunity for more than sixty Hunt Middle School students to be involved in a first-rate theatre performance. Special thanks go to Very Merry’s Don Wright for his great work with our students. Felix Nadworny starred as Willy Wonka and Will Belluche starred as Charlie. It really was a fantastic show and all of the cast and crew did a great job! With spring upon us we are busy planning for the end of our school year which will be here before we know it. Due to weather-related school closures during our snowy winter our last day of school will now be Monday, June 19th. Our eighth grade promotion ceremony has been moved to Thursday, June 15th at 1:00 P.M. Another very special annual event to which we are looking forward happens on Friday, May 26th when we host next year’s sixth grade students for our annual Step Up Day. On Step Up Day current fifth graders will visit Hunt to learn all about our school and the awesome learning experiences that lie ahead during their middle school years. More information on these exciting HMS events will be sent out to families soon. We are also gearing up for our eighth grade class trip. This year, as in the past several years, our HMS eighth graders will be taking a class trip to the Six Flags-Great Adventure Amusement Park in Lake George, New York. Students are currently raising funds for their trip through a cookie dough sale. Please consider purchasing a tub of cookie dough from an HMS eighth grader or from our main office to help support this fun culminating experience for our students. Our aforementioned HMS play was made possible through the efforts of many parent and guardian volunteers who eagerly donated their time and talents to providing a high quality dramatic experience for our students. These efforts included set construction, costume design, makeup application, coaching and instruction on acting, singing and dancing, and many other tasks. These volunteers’ dedication and role-modeling are invaluable to making our yearly drama production a success. Special thanks go to a special group of parents who have been enthusiastic and active supporters of our drama program during the years that they have had students at Hunt. Colby Kervick, Brooks Elder, Kate Belluche, Bella Nadworny and Kat Kleman have dedicated countless hours to helping make our drama productions fantastic experiences for many, many past and present Hunt students. Parent Kate Stein has been working with 4 boys in the Math Counts competition at UVM. Shout out to Allen Matson for all his help! She also shared that HMS came in 2nd place in the middle school scholar’s bowl, behind Mater Christi. 4 boys participated. We could sponsor a team and provide tshirts. Consider sponsoring the teams and putting in the budget for next year. Seven students have signed up to participate next month in the GeoBee, at Essex middle, representing the HMS team. The Hunt PTO will need new leadership for next year. Please consider it. Next month (May) is our last meeting for the school year. We will set up a Signup Genius and need a lead person to coordinate. HMS T-shirts! The PTO will sell at 6th grade Parent information night scheduled for May 25th and will do another round of flyers home with students. 2 sample shirts have been donated to the office for display. Could we get Student Council support? May 8 is deadline to submit dates for printed 2017-2018 BSD calendar. Need to decide on next year’s events: Back-to-School social, Harvest Dinner? Breakfast/Auction, Plant Sale? Other? District mediation updates can be found on BSD homepage, link for negotiations page. Checking account balance eff 3/31/17 is $9,554. Of this, $5,708 is unrestricted. Approved outstanding funding requests and budgeted expenses total $1,580. Update on the Play - huge success! We are losing 2 of the 3 production managers next year. Volunteers needed to take this on. Update on new fundraiser - Pancake Breakfast/Auction, brought in ~$2,400. Great volunteers, cooks, donations, and attendees. Hope to see more staff next year! Will donate $150 proceeds from 50/50 raffle to local food pantry. Where to distribute remaining funds? Staff Appreciation week starts May 1. Choose date to do something nice for Staff. Last year, goodies and flowers. Need someone to lead, set up Sign-up Genius. New HMS magnets to replace the traditional HMS Honor roll bumper stickers. This will be a way to celebrate all student success, and incorporate the new HMS logo for recognition in the community. Will look into pricing. Last meeting of 2016-2017 is May 18th. Need 6th-7th grade parents to attend! Have you purchased your Hunt Tee Shirt yet? 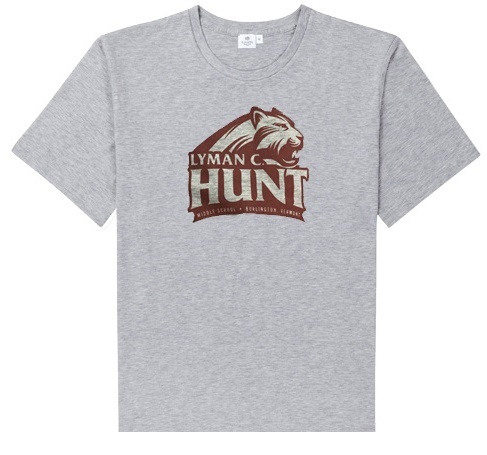 We have Men's and Women's cuts,in grey, with the cool HMS panther logo. At only $13 each it's a great way to show off your panther pride while supporting student activities at the school. You can purchase anytime by contacting the PTO at huntmiddleschool@gmail.com.